Uh-oh: Early Droid 2 Units Having Signal Issues? Don’t fire up the Antennagate Alarm just yet, but we’re hearing a good number of reports within our geeky circle that Motorola’s brand new baby, the Verizon Droid 2, might not be so good with that whole maintaining-a-solid-signal thing. We’re not sure just how widespread the issue is — this thing did just ship two days ago after all (hell, a lot of people are just getting their mail ordered units today), so it’s a bit tough to gauge. Amongst those we know who have had’em for a day or two and who pay an nearly obsessive amount of attention to stuff like this, however, it’s pretty much unanimous: these early units seem to be having issues. The signal on one of the two units we received is all over the board, dipping from full signal down to nearly none whilst sitting in the same spot (and no, we’re not holding it wrong). Engadget’s review says that four out of four of their units show endlessly fluctuating bar counts, and our buddy Rich Brome of Phonescoop says he’s having bad luck with his, as well. Thats 6 review units, all showing signs of signal woes. Not a good sign. Could it just be the early units? Perhaps. Can it be fixed with a software patch? Hopefully! We’ll keep digging and let you know what we find out — but in the mean time, keep your ear to the ground and let us know what you hear. 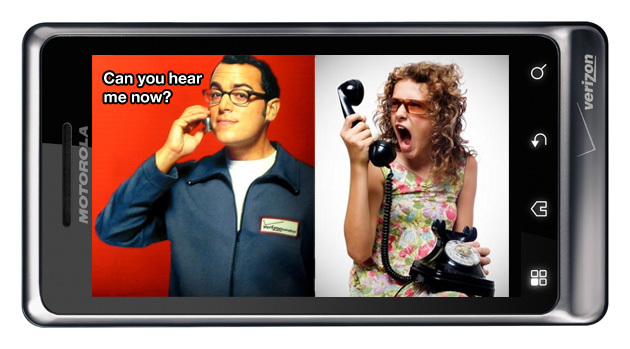 If you’ve picked up a Droid 2, drop a comment below and let us know how your signal looks.